(CNN) -- Howard Unruh, a World War II veteran accused of killing more than a dozen people in a deadly shooting spree in New Jersey 60 years ago, died Monday, authorities said. He was 88. Howard Unruh died Monday in a nursing home in Trenton, New Jersey. 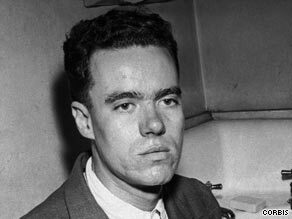 Although he was never found competent to stand trial, authorities and witnesses say Unruh methodically walked Camden's 32nd Street on the afternoon of September 6, 1949, targeting several business owners on a hit list and firing at others who crossed his path, including children. The weapon of choice was a German-crafted Luger pistol. Another boy was killed while getting a haircut. The barber, 33-year-old Clark Hoover, had been on the list. Though the case never went to trial, Unruh was considered by some as the first single-episode mass murderer in the United States. Unruh's mental status was reviewed by the courts, reviews that always resulted in his continued commitment, according to the Camden County prosecutor's office. He died Monday at Providence Nursing Home in Trenton at 3:35 p.m. after an extended illness, officials said. Ron Dale was inside a shoe shop off 32nd when the gunman came through the door and fired twice at shoemaker John Pilarchi, 27, who died instantly. "He shot the shoemaker, turned around, looked at me and walked out the door," Dale, who was 8 at the time, told CNN Radio. "It just wasn't my turn." It was the weekend before school started. Dale said he ran home but knew that his big brother and other kids would be getting haircuts and doing other stuff for first day of school. "Back in those days, there was no such thing as people going around with guns like they do today," said Dale, now a military veteran and retired ironworker. Even as police scrambled to catch the gunman, he reached his apartment, where he barricaded the door. Witnesses had identified the shooter as Unruh, described as 28-year-old recluse and "religious nut," according to the accounts compiled by TruTV. Dozens of police officers surrounded the two-story building that housed Unruh's apartment, which sat next to the pharmacy owned by Maurice and Rose Cohen. The couple and Maurice Cohen's mother were all killed in the spree, but their 12-year-old son, Charles, survived by hiding in a closet. Officers, armed with rifles and machine guns, riddled the building with bullets. He finally surrendered after police tossed cans of tear gas through a bedroom window. During questioning, he gave County Prosecutor Mitchell Cohen a play-by-play of the massacre, according to the Tru TV accounts. Unruh had left his home that day, he told Cohen, with one bullet in the chamber, 16 loose bullets and two clips of eight, because his neighbors "had been making derogatory remarks about my character." After a battery of tests were conducted, Unruh was diagnosed with "dementia praecox, mixed type, with pronounced catatonic and paranoid coloring" and was ruled criminally insane, making him immune from prosecution. Ron Franscell, a Texas-based author, has researched the Camden massacre for a book about victims who have survived mass killings in modern American history. He's walked Unruh's "walk of death" and interviewed several witnesses of the shooting. Franscell described Unruh as a strange character who was a good soldier in World War II. "But he does odd things while he's there; he keeps detailed notes of the Germans he kills," he told CNN Radio on Monday. He returned home a changed man. Unruh was an introvert in his neighborhood, known to dress up in a suit and tie, with combat boots and a Bible tucked under his arm. He would walk around the streets and quote scripture, Franscell said. "He's not right. ... He just came back a little different." Among the Camden survivors Franscell spoke with was Charles Cohen, the son of the slain pharmacist. Franscell said Cohen coped by stashing scores of newspaper clippings on the 1949 shooting into a suitcase. Through the years, Cohen "really saw a day in the future when Howard Unruh would die and he saw it as a release for him," Franscell said. "His hope was to see Howard Unruh's day come so he could take that suitcase out and bury it. Cohen never saw that day. He died two months ago. CNN Radio's Ninette Sosa contributed to this report.